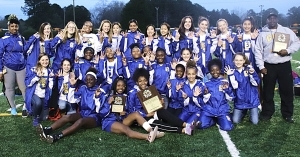 The Chamblee Lady Bulldogs held off a late charge by the Chapel Hill Lady Panthers to win their third consecutive DeKalb County Middle School Track Championships title 77.50 to 66 at Godfrey Stadium on Monday. It is the sixth title in 11 seasons for Chamblee under the guidance of Coach Terrance Jett who was awarded the Coach of the Year Award. Chamblee’s three-peat of 2017-2019 goes with titles in 2009, 2010 and 2012. Chamblee came out of the field events and 1600-meter run on Saturday leading Peachtree by just 3.50 points while Henderson (15) and Chapel Hill (4) trailed. Following the 1600m sprint medley, 800m spring medley and 4x100m relays to open Monday’s track finals, Chamblee (46.50) built a lead of 13.5 points over Henderson (33), 22.50 over Chapel Hill (24), 25.50 over Tucker (21) and 26.50 over Peachtree (20). The Lady Bulldogs finished second in both 1600m sprint medley and the 4×100. 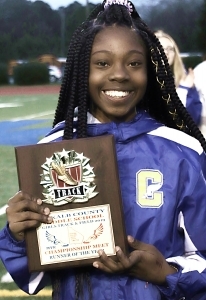 Chamblee’s Jaia Jackson was named Girls’ Most Valuable Runner. Henderson (4:34.47) won the 1600m medley, Freedom (2:01.42) won the 800m medley and Chapel Hill (50.63) started its move up the ladder with a win in the 4x100m relay. Despite having loss the services of Jordyn Parker for the finals Chamblee continued to build on its lead taking an 8.5 lead into the final event (4x400m relay). Chapel Hill collected 13 points in both the 400m dash and the 100m dash as the Lady Panthers continued to close the gap and Henderson picked up 12 points in the 800m run and eight more in the 200m dash to close within the 8.5 points of Chamblee heading into the 4x400m relay. Chapel Hill rolled to a 3.35 seconds win over Chamblee in the final event, but the Lady Bulldogs second place finish clinched the title. Peachtree’s Trinity Williams picked up three gold medals during the meet winning both the 100m (12.59) and 200m dashes (25.93) to go with Saturday’s win in the long jump (17-10.00) which was just 1.5 inches short of the meet record. Williams’ teammate Claire Shelton captured gold in the 800m run (2:31.50) to help Peachtree’s fourth-place finish overall. Amya Hughes aided Chapel Hill’s second place finish with a gold in the 400m dash (1:00.70). Henderson’s Hailey Davis won the 1600m run (5:45.55) and finished as the runner-up to Shelton in the 800m run (2:33.84) as the pair spots in the two races. Tucker’s Alana Freeman won the shot put on Saturday with a toss of 32-09.00 to round out the gold medal winners. 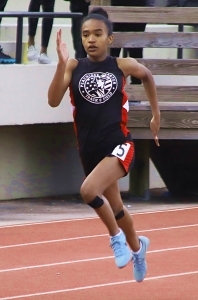 Chamblee chose Jai Jackson as their Most Valuable Runner as she performed with her lower leg wrapped most of the day during the finals.